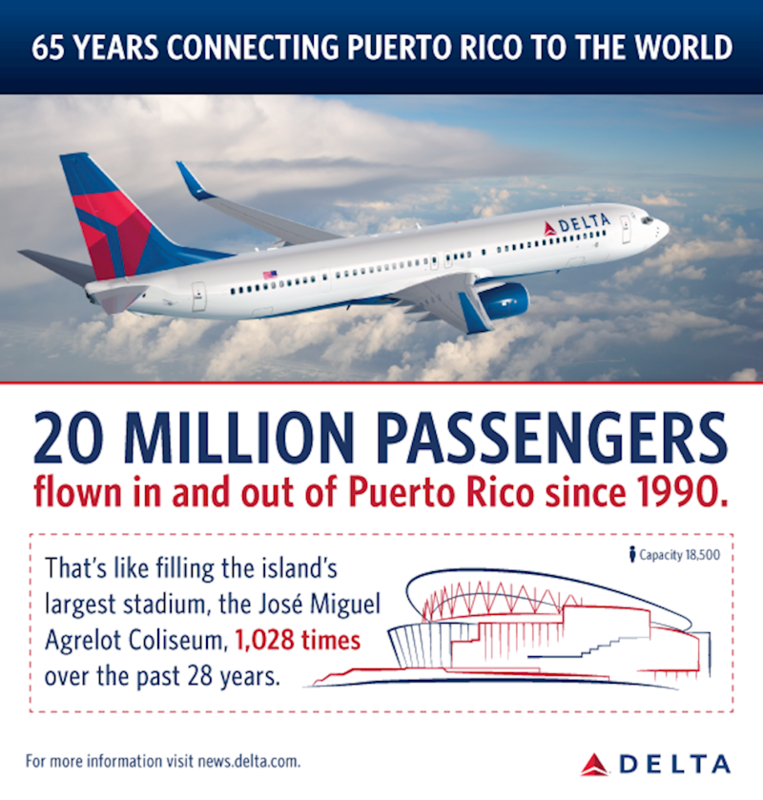 Delta Air Lines is celebrating its 65th anniversary in San Juan, Puerto Rico, its station with the longest uninterrupted service in Latin America and the Caribbean. The airline has increased flights to Luis Muñoz Marín International Airport from New York-JFK and Atlanta. Delta offers three daily flights from ATL to SJU and three daily flights from JFK to SJU. Due to growing demand, Delta is reinstating the fourth ATL-SJU daily flight, effective June 8. The airline operates ATL-SJU with a Boeing 757-200 aircraft with 180 seats, and JFK-SJU with a Boeing 737-800 with 160 seats. "I want to thank our customers for their preference as they witnessed and supported Delta's growth over the last 65 years," said Luciano Macagno, Delta's Managing Director - Latin America and the Caribbean. "Achieving more than six decades of uninterrupted service would not have been possible without a team dedicated to serving with excellence every customer in every flight. I thank each of our San Juan colleagues for all you do every day." Michael Luciano, Delta's Station Manager—San Juan, said, "Delta is part of Puerto Rico's history, and our team proudly serves each customer be it those who travel to visit friends and family, or business people and tourists who support our economy. Our San Juan team has had the privilege to take care of distinguished composers, artists, sports superstars, and beauty queens, each of them representing Puerto Rico's pride and legacy throughout the world." Underscoring its commitment to the market, the airline is working with the Puerto Rico Tourism Company and the Puerto Rico Hotel and Tourism Association to sponsor local events and festivals showcasing Puerto Rico's unique culture, food and music. "Delta is an important ally that continues to bring together more people and businesses to promote Puerto Rico as an unparalleled tourism and business destination in the Caribbean," said Ricardo Rosselló Nevares, Governor of Puerto Rico. "We look forward to continuing to work together to showcase our island to the world. Puerto Rico is open for tourism, and we are looking to a bright future together with Delta." Carla Campos, Acting Executive Director of the island's Tourism Company, said, "Delta has proven to be one of Puerto Rico's strongest airline partners. Its commitment to our destination has been evidenced by the consistent growth in the market and expansion of routes and frequencies to San Juan over the past 65 years." Delta is sponsoring Saborea Puerto Rico, an extravaganza from April 5 – 8 that showcases Puerto Rico as a go-to destination for international foodies. The airline is partnering with the Puerto Rico Tourism Company and Hotel and Tourism Association to host U.S. media. Delta will toast the milestone at Saborea's Bubbles and Bites event April 5. Delta is also a sponsor of the 28th Puerto Rico Heineken Jazz Fest, celebrating the best of jazz music in Latin America. Recently, 111 local Delta employees earned USD $500,000 in profit sharing for their hard work, benefitting local communities. After Hurricane María, Delta coordinated three humanitarian flights to San Juan from JFK in October, delivering supplies and more than 150 state troopers, emergency and FEMA personnel to the island.